Guinea Pigs need occasional baths, maybe twice a year, just to keep their coat nice and clean. 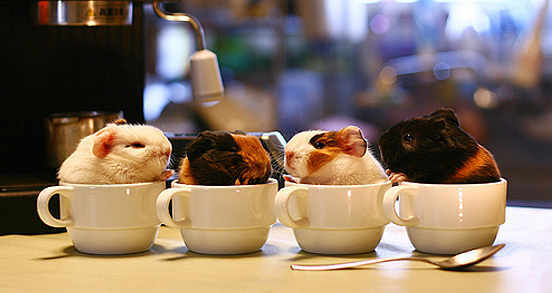 Some Guinea Pigs love it and others, well you need 10 hands !! Make it a relaxing experience and your Guinea Pig will hopefully get to like it. 2 bowls one for washing, other for rinsing. Shampoo -Johnsons insecticidal shampoo is great and smells lovely you can also buy organic products from Gorgeous Guinea Pigs on line shop. Towels for drying, post bath cuddles. Shampoo your Guinea Pig also pay attention to dirty paws and gently rub the ears,talk to them and have a little treat available.You can check ears inside and wipe the pouter area gently with a cotton bud but DO NOT push into the ear canal.Piggy ears can get a little greasy like ours.Boar grease spots may need attention,thats the greasy spot at the base of the spine.If it needs cleaning then dab with swarfega,leave on for 10 min then rinse off during bath time. Dry your Guinea Pig gently on your knee,check their coat and give the coat a gentle groom. Keep you Guinea Pigs in a warm place after a bath an indoor cage overnight is ideal. 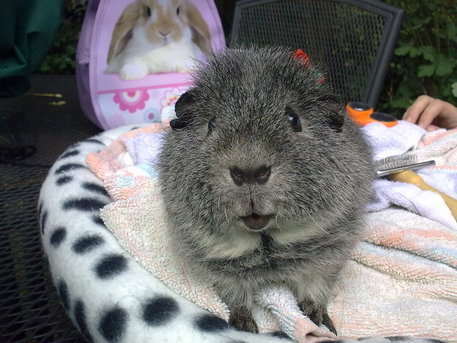 In the summer Guinea Pigs can bath on a warm day and let them dry on the lawn with shade if they need it. Clipping nails is important you keep feet healthy and it gives you a chance to check feet health.Ask you local vets to teach you ! Keeping track of the weight of your piggies is useful not only to yourself, so you can see what is a normal weight for your guineas, but also to your vet. When diagnosing an illness, it can significantly help a vet if he sees the amount of weight lost and over what period of time it has occurred. “Feeling” the condition of your piggies is still important as some guineas slim down without actually losing weight - a common development as they start to head towards their senior years. But just knowing how your piggies “feel” is too unreliable, it doesn’t tell you how much weight has been lost, which will not help your vet and will not give you an accurate view of the overall health of your animals. How often should I weigh them? Weekly weight checks is ideal, especially with young guineas who are still growing and with pregnant sows who need close monitoring. It is fine to weigh once every two weeks, but ideally no less often than this as there would be little point in tracking the weight; fluctuations would not be monitored as effectively and a sudden drop in weight perhaps not spotted soon enough. 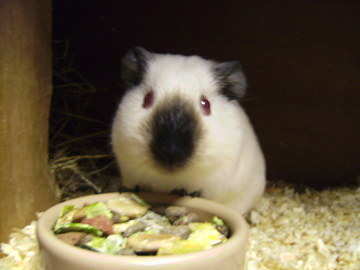 Guinea pigs who are ill, especially ones who are refusing to eat, should be weighed daily. 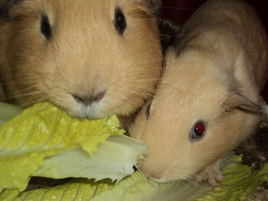 If the guinea is continuing to lose weight each day, it usually suggests that the food intake is still too low and you need to increase the amount of syringe-feeding you are doing (a guideline amount, for an adult guinea pig who is not eating for himself at all, is at least 60-120ml per day). What is a healthy weight for guinea pigs? Is it possible that my guinea is overweight? What if the weight is not exactly the same each week? 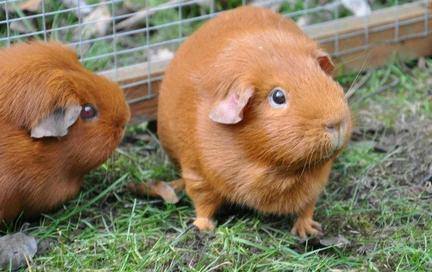 Most guinea pigs reach their adult weight at 9-12 months. Their weight should stabilise, although it is normal for another notable gain to occur a few months later. As with every other species, including humans, some are naturally very large while others are far more dainty and petite. The generally accepted weight range is 2lb to 3.5lb, or 900g - 1600g, although some piggies may be perfectly healthy and slightly outside these margins. As long as the piggies are eating well, healthy and can move around normally, you should not need to fret about the size of them. Very few piggies are actually overweight or obese. It is normal for guineas to have quite a large double-chin known as a dewlap. The main suggestions that a guinea may be a little heavier than he should be is a lethargic lifestyle (typically only moving to get some food, and then shuffling back to his favourite sleeping spot!) and if there is a lot of excess fat/flab around the abdomen and around the tops of the legs. If a piggie is unable to move freely and normally due to his weight, then he does need his food intake altering slightly. 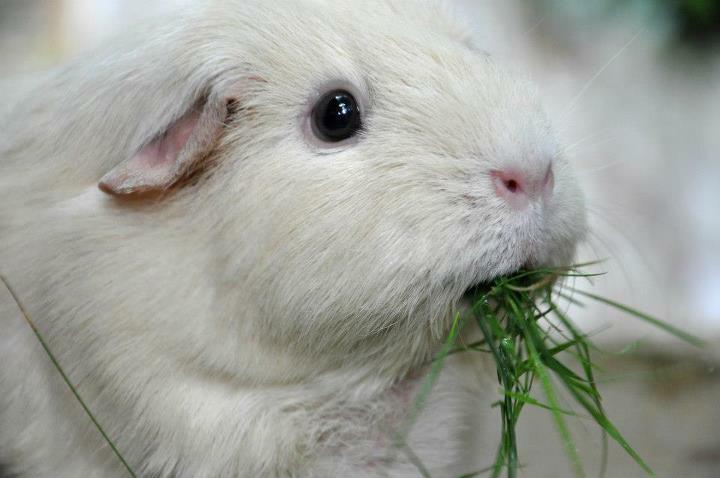 If you suspect your guinea pig is overweight, do not put him on a “diet” - the only things you should need to do are cut down on the dry food, switch to a higher quality, hay-based plain pellet (if you’ve not already), and increase the exercise. One way to encourage exercise is to spread the daily servings of fresh veggies all around the exercise area, so the piggie has to move around a wide area to find his favourite foods. Lots of toys - blankets, tunnels, balls, newspaper tents, soft toys - will also encourage a guinea pig to take an interest in his surroundings. An absolute minimum of 1 hour exercise time should be offered every day to overweight piggies - although as with all guineas, the smaller the cage the more time they should have to run around on the floor/in a large exercise pen. It is not often that you will have identical readings every week, especially if you are weighing in grams. Some small differences between readings is normal; a fluctuation of up to 2oz / 60g is usually okay. - Young piggies will gain an average of 1oz / 30g per week. - Pregnant sows will gain an average of 2oz / 60g per week. The weight gain in pregnant sows does vary hugely depending on the age of the sow and the size of her expected litter, so do be sure to monitor the guinea for other signs of pregnancy if you do suspect she is “in pig”. What do I use to weigh them? Normal kitchen scales work just fine, as long as they give an accurate reading. Many people find the scales with bowls that sit on top to be ideal, but as long as the pig can fit on the scales, almost any type should be fine! Mechanical and digital scales are both useful, digital is ideal for a quick reading but it is mostly down to personal choice - and what you have available! Its important to get to know your healthy Guinea Pig so you can spot the signs of a poorly piggie, weighing monthly is a good habit to get in too. Feed a balanced diet with regular exercise and you will avoid porky piggies !!! Please register your Guinea Pig with a good small animal vet, dont feel uncomfortable about asking if they are experienced with Guinea Pigs, its important they know about Guinea Pig health.A good place to enquire after Guinea Pig friendly vets is The Guinea Pig Forum. Monthly - Weigh ( weekly,daily, if your guinea pig is poorly,recovering post op).Keep your records of health checks. Weekly - Check whole body.Eyes, skin, around the mouth, feet, genital area, bottom.If anything is out of the ordinary seek advice. Check nails / coat / limbs / poops and watch out for normal coloured urine (Beetroot and carrot make the urine a pinky orange colour ! so dont panic). Vit c intake of a guinea pig is very important,one of the most important dietary needs is vitamin C, guinea pigs do not make there own vit c ,so they need fresh fruit and veg every day to ensure this need is met. Dried food must contain Vit c which, is why rabbit food is not suitable. Poorly piggies may need vitamin C supplements,please dont bother with drops in water.You cannot know how much they have had.Oxbow or wilkinsons do vit c tablets which,are easy to crush.You can mix with 1m to 2ml water and syringe into your Guinea Pigs mouth.Home bargains sell a fab little mortar and pestle for under £2.Look to supplementing between 50 to 100mg daily. Guinea Pigs need occasional baths, maybe twice a year, just to keep their coat nice and clean.Some Guinea Pigs love it and others, well you need 10 hands !! Make it a relaxing experience and your Guinea Pig will hopefully get to like it. 2 bowls one for washing,other for rinsing. Shampoo your Guinea Pig also pay attention to dirty paws and gently rub the ears,talk to them and have a little treat available.You can check ears inside gently with a cotton bud but DO NOT push into the ear canal.Piggy ears can get a little greasy like ours.Boar grease spots may need attention,thats the greasey spot at the base of the spine.If it needs cleaning then dab with swarfega,leave on for 10 min then rinse off during bath time. 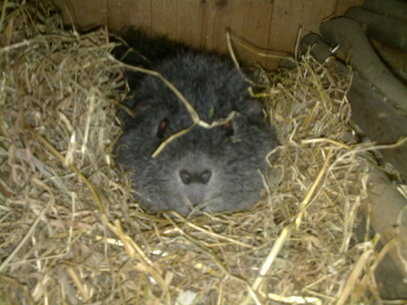 Keep you Guinea Pigs in a warm place after a bath an indoor cage or box overnight is ideal. If you have outdoor Guinea Pigs bath on a warm day and let them dry on the lawn. A recent rescue guinea pig had a 2 inch round fur ball on his bum !! this can damage the skin and cause infection.The above picture is after a good clipping. 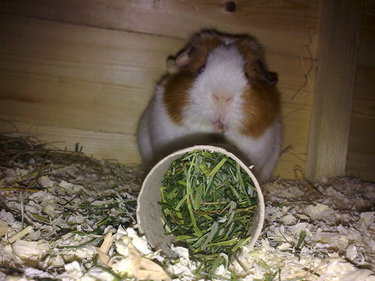 Hay is very important in a guinea pigs diet and should be provided in unlimited amounts,this helps to keep their gut working and their teeth in good shape.Use good quality,dust free hay,ask us for advice.Lovely farm meadow hay is the best and bales can be excellent value.The stringy type is best as it encourages movement during eating and makes it fun.My piggies dont like chopped hay. Shavings are our prefered choice and we are fully aware of all the debates over various types of bedding ! and i have tried most of them.We use high quality dust free shavings from the meadows animal feeds supplier - Cheshire choice is a great brand also "Thorough bred " brand this is completely dust free.We have not had any respiratory problems. Cleaning is very important, its just not nice to have poopy piggies. Cages need cleaning out a minimum of twice weekly,possibly more in the summer months.Always remove dirty hay daily and replace. Yum Yum clean hay ! Line cage with a good layer of newspaper - Just roll up poop at clean out. Fresh shavings and hay - Sleep hay and eat hay needs providing.Metal hay balls are also good to hang eating hay in,my Guinea Pigs love to play with them. Water must be fresh daily in a clean bottle, would you drink water from a greeny bottle ??? Sterilise monthly with baby sterilising tablets,use cotton buds to clean the spout and tube.Guinea Pigs are messy drinkers and can spit food back into the bottle. Piggies need nice refreshments every day !!! 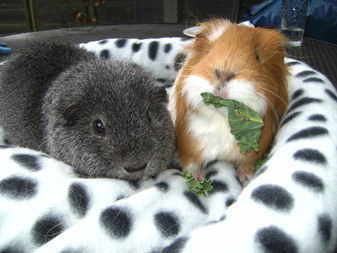 Dried food Guinea pigs need a dry food designed for their needs.We recommend guinea pig only pellets/ nuggets rather than a muesli style mix to prevent selective feeding, ask us for advice.We use and recommend - Science Selective with dandelion and nettle.Feed pellets which have no added sugar. Vegetables and Fruit guinea pigs love these !! There are so many to choose from dont feed the same every day look on the web for information or ask us,you can include herbs,fruits and even exotic items !!! Our web links page has food lists to download. 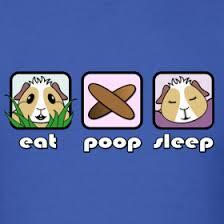 Did you know that Guinea Pigs pass 2 types of poop ? Guinea pigs release two different types of poop.One type is the one we all know which is just solid waste.The other type which guinea pigs excrete is called caecotrophs.These caecotrophs contain water,vitamins and protein. Guinea pigs excrete caecotrophs because they cannot fully chew their food and thereby are required to digest their food a second time ! Its very common to see your Guinea Pig bend over its tummy and grab a poopy snack !! Its an important part of their normal digestive system.